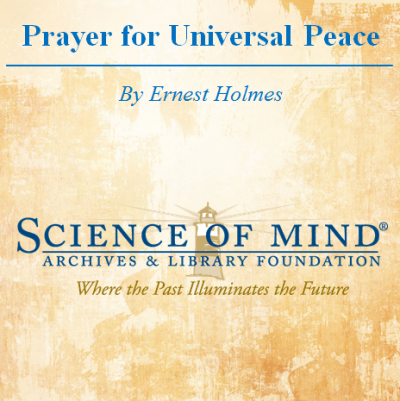 A universal prayer for the good of all mankind, to bring peace to our hearts, to our homes, to our minds and to our souls, from today to eternity. Infinite Spirit, bring peace and good will to all peoples. Direct the pathway of every nation into unity, happiness and prosperity. Remove the thought of fear and greed from the mind of man. Let every thought of hate be turned to love, every thought of fear be turned to faith, every thought of doubt be turned to certainty, every thought of war be turned to peace. Heal the wounds of the world and bring peace upon the face of the earth.